The personal information area is reserved for the personal use of the Optima user. You can enter the personal information area by clicking the head icon in the top left corner. The navigation keys for moving between the workspace and the personal information area are located at the top of the personal information view. Check and enter your user information. You can also add your own picture to Optima. Click ‘Try a new image’ and upload the edited image file from your own computer. Save the changes by clicking ‘Submit changes’ in the bottom left corner. Your user information is the default view seen by all other members of the workspaces in which you are a member. To prevent other members from viewing your user information, go to ‘Settings’. If you prohibit other members from accessing you user information, it can only be viewed by the course organiser. At ‘Settings’, you can change the default language. Please note that the administrator of a workspace may force its workspace to use a specific language (which can be English). You can also determine the settings of the mail reminder. You can order RSS subscriptions on the events in your workspaces (new objects or discussion messages). If you prohibit other users from viewing your user information it can only be accessed by the system administrator. At ‘Personal statistics’ you can view the statistics covering your visits to Optima and the manner in which you use it. You can also view the summaries of the multiple choice exercises you have completed. The statistics are updated on a daily basis. In the ‘New and modified’ section, you can view the new and recently edited material of your workspaces and all new messages. The section lists all new objects created during the past 24 hours in each workspace. You can read all new messages in each discussion list, all private messages and the comments attached to the messages. In ‘Announcements’ you can view all announcements pertaining to the environment or the workspace. The announcements also appear on the initial view as you log in to Optima. ‘Your results’ is mainly intended to students, whereas ‘Result management’ deals with the same issues from a teacher’s point of view. The following Optima exercise functions can be accessed through ‘Your results’ and ‘Result management’: return boxes, assignments, forms, multiple choice exercises and multiple choice drills or exams. Links for each workspace are given. 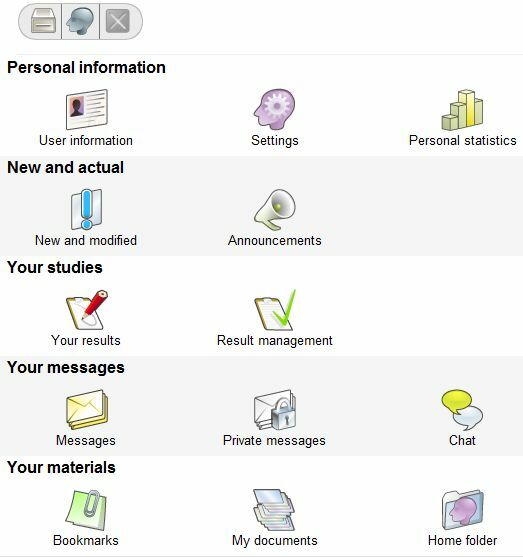 In ‘Your results’, students can view their assignments that have been evaluated and assignments that they have returned/have not returned. In ‘Result management’, teachers can view all or only the latest assignments of their students. In ‘Messages’, you can read messages on the discussion lists open to you. The messages are grouped by workspace and discussion list. You can determine the message view from the dropdown menu ‘Select messages’. In ‘Private messages’, you can communicate with specific members of your workspaces. These messages cannot be viewed by others. In ‘Chat’, you can join chat forums open to you. With ‘Bookmarks’, you can create a link in your ‘Personal information’ that provides you with access to interesting folders and objects in your workspace. To create a link, go to the menu of the folder or object on the right-hand sidebar and click ‘Add bookmark’. ‘My documents’ provides you with a list of all documents that you have edited for different workspaces. You can also open any of the documents. The ‘Home folder’ in the personal information area is your personal folder where you can create your own objects using the ‘New object’ function and transfer them to/link them with your workspaces.